Shah Net is one of the fastest growing web solutions on the internet. This advanced technology enables people and community across the globe to find their perfect soul mate, especially with the help of automated comparisons, matching and choosing from the giant database of profiles. Marriage is an institution that becomes the foundation of a stable society. Matrimonial portal development solution helps to create a web portal that provide a platform to the single individuals who search for Grooms/Brides. You can utilize your outstanding matchmaking experience in helping the people who seek for true life partners by launching a new website promoting matchmaking and matrimony. The concept of marriage portal comes from the dating portals. These websites created for those who believe in marriage rather than simply dating. This is why matrimonial sites are commonly used by those who prefer arranged marriage. 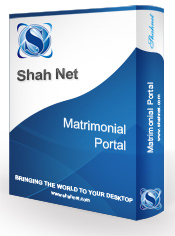 As a portal development company, Shah Net Technologies Pvt. Ltd, develops excellent matrimonial solutions. With advanced features and user-friendly tools, our matrimonial development is efficient in given that excellent solutions. Keeping the growing demand in mind, we have developed advanced matrimonial portal with great features for people to find their life partners from anywhere in the world. Our services are proficient enough to compete with any top marriage website development firms in India. What are the prominent features of Shah Net Matrimonial Portal? Profile - Marriage is the most important event in your life, creating an impressive profile page is a crucial step. Profile is important to find your success in a matrimonial website. To stand out alone in the crowd in order to draw the attention of the desired singles in the website your matrimonial profile should be correct. You need to get your profile uploaded to the website on completion of your profile writing and the website enable your profile to be online and noticed by other people who search for their life partners. Partner Search - With the help of the search option given in the matrimonial portal, you can do quick search on some specific interests regarding caste, age, physical attributes, job, location, and so on. You can also use advance search option. Privacy setting - Another great utility is privacy setting option. If you want to protect your personal information from abusers, you can always go for the privacy setting and can safeguard your privacy. In this features u can also protect your photo Favorite Profiles - This feature provides the facility to mark other profile owners as your favorites. Receive various types of requests - Members are sending various types of requests, for horoscope, photo, reference and either accepting or declining it.